The presence of an ergonomic office chair is becoming more common – and for many very good reasons. So many health and work benefits are provided when used, preventing work-related injuries like back, neck and shoulder pain. With some of the more complex styles, although it will always be a good choice for individual usage, it can become time-consuming and inconvenient in an office where more than one person will use the same seat during the day. In many such instances, proper adjustment is not done because it takes too long. This is where a task chair comes in handy. What is a Task Chair? Created to be an in-between ergonomic office chair for shared work stations, task chairs provide basic ergonomic support that is easily and quickly adjusted. Since there are no benefits to be gained if an ergonomic chair is not properly changed for each person, an office task chair eliminates this step by providing a seat that can be quickly customized for each user’s comfort. Easy adjustment is used as the motivator to get users to spend just a few moments to change the chair and at least come close to a therapeutic and comfortable position. 1.Ease of Adjustment – As already mentioned, the purpose of ergonomic office task chairs in areas where multiple users work is for changes to be quick and easy. In order to achieve such a goal, the seat height, backrest position, and armrest should be controlled by easy-to-use levers or wheels. Even better, a seat without armrests is normally fine for short periods of an hour or two as long as adequate lumbar support is provided and good posture is encouraged. Workers must learn how to change the chair as well as the proper sitting position; once it is grasped that the seat can be changed in moments, it will become more routine to make such changes even if only for short periods of time. 2.Quality Construction – Keeping in mind that an office task chair is going to be used often and adjusted frequently, it is essential that it be made of the best quality material with the best construction methods. Chair bases and casters must be strong and made specifically for the flooring where it will be used as it will see a lot of floor action with changing users. Additionally, all adjustment mechanisms such as levers or wheels need to be very durable to allow for continual use by different workers making necessary changes. The fabric should be sturdy, able to withstand continual friction from all the different users sitting and rising frequently, and easy to clean as well. While outfitting an entire office with individual ergonomic seating can be expensive, the good news is that in the more common areas with multiple users, an ergonomic task chair can be the best choice both for usage and cost. For those workers who remain seated for hours, access to a higher quality, more adjustable ergonomic chair is the right choice; however, task chairs are perfect suited to keeping employees correctly seated and healthy when continually moving around an office to handle many different tasks. Hopefully, this information will help find the right ergonomic task chair to keep employees as comfortable as possible! The Ergonomic Chairs Store Has the Right Ergonomic Office Chair To Update Your Workspace! 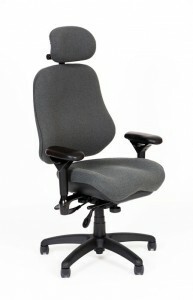 Could your work environment benefit from an ergonomic office chair? Give the Ergonomic Chairs Store a call at 979-217-3044 to learn about the advantages an ergonomically furnished office can provide!